You Send Me: The interface for PicCard is a bit barren—this is the screen for entering the address of your recipient—but when it comes to sending postcards from your iPhone, the app gets the job done. 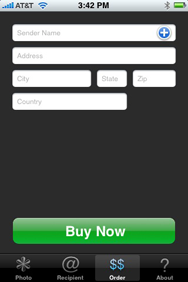 The overall look and feel of the app could use a little fine tuning, and the PayPal integration is a bit clunky. But since I have been using it, Pindropper has pushed out a a few updates that have improved the overall use. I really like the concept, and it's a neat way to blend older, traditional correspondence with the iPhone. PicCard is compatible with any iPhone or iPod touch running the iPhone 2.x software update.